The Rann of Kutch, also known as the Great Rann of Kutch (there's a Little Rann of Kutch as well), is a remarkable place to visit in Gujarat. Much of it consists of the world's largest salt desert, measuring around 10,000 square kilometers. What makes it even more amazing is that the salt desert is underwater during the main monsoon season in India. For the remaining eight months of the year, it's an enormous stretch of packed white salt. Here's all the information you need to visit it. The vast and arid expanse that is the Great Rann of Kutch lies to the north of the Tropic of Cancer (you'll pass through it and see the sign), at the top of the Kutch district. It's best approached via Bhuj. Dhordo, approximately 1.5 hours north of Bhuj, is being developed by the Gujarat government as the Gateway to the Rann. Dhordo is on the edge of the salt desert. It's most convenient to stay there, or nearby Hodka. The most popular choice is the Gateway to Rann Resort at Dhordo. It's made up of characterful Kutchi bhungas (mud huts), traditionally crafted and decorated with handicrafts. Rates start from 4,800 rupees for an air-conditioned double, per night, with all meals included. The Gujarat government has also set up tourist accommodations, the Toran Rann Resort, opposite the army checkpoint near the entrance to the salt desert. This resort is closest to the salt desert, although the location is not particularly scenic. Bhunga accommodations cost 4,000-5,000 rupees per night, plus tax. All meals are included. Another recommended option is the Shaam-e-Sarhad (Sunset at the Border) Village Resort in Hodka. The resort is owned and managed by the local residents. You can choose to stay in eco-friendly mud tents (3,400 rupees per night for a double, including meals) or traditional bhungas (4,000 rupees per night for a double, including meals). Both have attached bathrooms and running water, although hot water is provided only in buckets. Family cottages are also available. Visits to local artist villages are a highlight. The Rann of Kutch begins to dry up in October every year, steadily transforming into the desolate and surreal salt desert. The tourist season runs until March, and the above mentioned accommodations close at the end of March. If you want to avoid the crowds and have a more peaceful experience, go at the end of the tourist season in March. You can still visit the salt desert in April and May though, on a day trip from Bhuj. However, it's very hot during the day. Plus, there's an absence of basic facilities for tourists (food, water and toilets). You'll pretty much have the salt desert to yourself though! It's best to head out into the desert only in the early morning or evening, otherwise the salt can be blinding. You can take a moonlight camel safari into the desert. The full moon is the most magical time of month to experience it. Gujarat Tourism holds a Rann Ustav festival, which begins at the start of November and extends until the end of February. A tent city with hundreds of luxury tents is set up near the Gateway to Rann Resort at Dhordo for visitors, along with rows of food and handicraft stalls. The package price includes sightseeing trips to surrounding attractions. Activities offered included camel cart rides, ATV rides, para motoring, rifle shooting, kids' entertainment zone, spa treatments, and cultural shows. Unfortunately, the festival has become increasingly commercialized in recent years, which has resulted in pollution and garbage in the area. Some people complain that it's ruined the atmosphere. If this is a concern, ideally plan to visit after the festival is over. 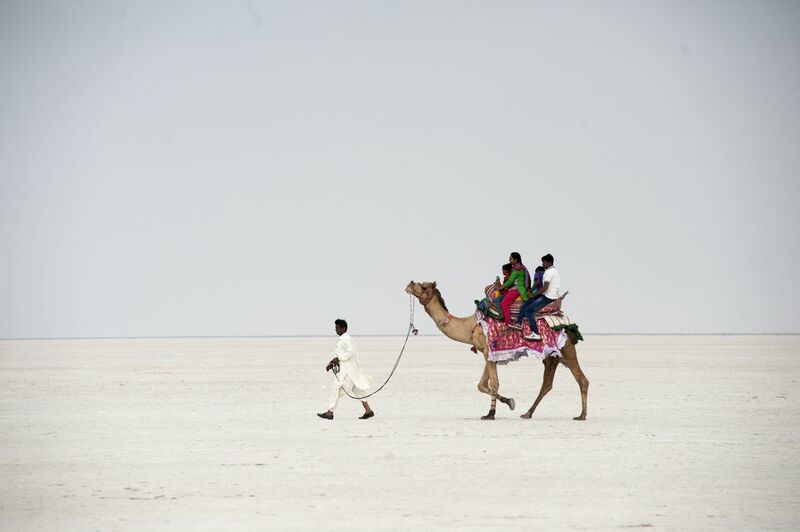 The Rann of Kutch is a sensitive area, due to its proximity to the Pakistani border. Therefore, written permission is required to visit the salt desert. This can be obtained on the way at the Bhirandiyara village (famous for mawa, a sweet made from milk) checkpoint, about 55 kilometers from Bhuj. The cost is 100 rupees per person, 25 rupees for a motor bike and 50 rupees for a car. You'll need to submit a photocopy of your ID, plus show the original. Do note that the checkpoint may not open until late morning (around 11 a.m.). Permission is also obtainable from the Gujarat Police DSP office in Bhuj near Jubilee Ground (it's closed Sundays, and every second and fourth Saturday). You must present the written permission to the officers at the army checkpoint at the entry to the salt desert about 45 minutes further on. The resorts mentioned above will arrange transport for you from Bhuj. There are a couple of ways of getting to Bhuj. If taking a train, it's most convenient from Mumbai (15 hours). Flights to Bhuj are also available from Mumbai. Compare Flights to Bhuj and Save. Buses to Bhuj are available from many places in and around Gujarat, and the road is in good condition. If you want to do the Great Rann on a day trip from Bhuj, you can hire a cab or motor bike. Alternatively, small group tour packages are available. If you want to see the Rann of Kutch from a different perspective, Kala Dungar (Black Hill) offers a panoramic view from 458 meters above sea level. You can see all the way across to the Pakistani border. Kala Dungar is accessible via the village of Khavda, which is 25 kilometers away and around 70 kilometers from Bhuj. This village is home to artisans who specialize in block printing, including ajrakh block printing from Pakistan. It's best to take your own transport as public transport is infrequent. The old Lakhpat Fort (140 kilometers from Bhuj) also provides a fabulous view of the Rann of Kutch. Going on a guided tour takes the hassle out of planning and sightseeing. Kutch Adventures India is based in Bhuj, and is involved in rural and responsible tourism in the area. Owner Kuldip will put together a bespoke itinerary for you, including visits to surrounding handicraft villages (which Kutch is renowned for). Read more about the Kutch region and its attractions in this Ultimate Kutch Travel Guide.